When you start Inequality Graphing on the TI-84 Plus for the first time, the app creates two lists, INEQX and INEQY, to house the x– and y-coordinates of data points that you store in the calculator. When you exit Inequality Graphing, these data lists are not deleted from the calculator. So when you start the app again at a later time, any data previously stored in these lists will still be there, provided that you didn’t delete the lists from the memory of the calculator. When the Inequality Graphing app stores a data point, it appends that point to the other points already stored in the INEQX and INEQY lists. When you exit Inequality Graphing, the app does not clear the contents of these lists. So if you are graphing a new set of inequalities and want to store data points associated with the graph, it’s a good idea to clear the old data points from these lists. To clear the contents of the INEQX and INEQY lists, press [GRAPH][ALPHA][CLEAR]. The graph screen appears and the INEQX and INEQY lists remain in the calculator as empty data lists. 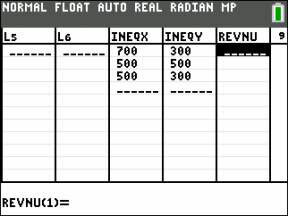 If an inequality graph is displayed on the screen, simply press [ALPHA][CLEAR] to clear the INEQX and INEQY data lists. If any other screen is displayed, such as the Y= editor, you must press [GRAPH][ALPHA][CLEAR] to clear these lists. The Inequality Graphing app can store any data point whose coordinates appear at the bottom of the graph screen. Such points are found using Trace, Pt of Intersection-Trace, or any of the first five tools in the CALC menu. to store the coordinates of the data point. You usually get a message saying, “Point appended to (∟INEQX, ∟INEQY)” or “Duplicate point.” The first message tells you that the x-coordinate of your data point is stored in the list named INEQX and the y-coordinate is stored in list INEQY. Press [ENTER] to get rid of the message and return to the graph. If the point is already stored in the calculator, you get the “Duplicate Point” message. Press [ENTER] to get rid of the message. The Inequality Graphing app will not store the point a second time. Press [STAT] to view the data stored in lists INEQX and INEQY. If the Stat List editor already contains 19 or 20 lists, then there is not enough room for the editor to display these two lists. This situation is remedied by deleting a few lists from the Stat List editor and then recalling the INEQX and INEQY lists.